I just upgraded to Windows 10. I was actually relatively happy with Windows 7, but ever since the upgrade to 10 proclaimed it was ready to install, my computer started giving me periodic BSOD (Blue Screen Of Death), with increasing frequency. Coincidence? Conspiracy theories aside my Windows 7 installation had been begging me to be put out of its misery for a long time, and if I was going to do a fresh install anyway, I might as well upgrade. Here are my recommendations for the upgrade and simplified step by step instructions of the process. 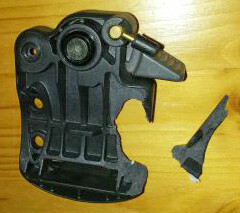 I recently purchased a manfrotto 324rc2 head with a damaged top plate for cheap. My plan was to repair the head for use with a small (and light) point and shoot camera. The top plate has mounting holes in two locations which I thought would enable me to just mount the plate in the second set of mounting holes, making for an easy repair. Unfortunately, upon close inspection, the damage to the plate was more extensive than just the mounting holes. The plate had several little hairline fractures which might result in a catastrophic failure if stressed too much.